In October 2012 Google finally closed one of the most efficient loopholes (or so it seemed) that was perpetuated by both business people and, unfortunately, spammers. We are talking about the exact match domain Update. This was really sad news for an entire industry of EMD tools that brokers and retailers came up with. We will succintly explain the phenomenon to you so that you better understand. In the past (in the beginning of SEO), it was possible to rank in the top 10 Google results with literally no back-links or ethical SEO practices. Compared to non EMD sites, EMD ones would appear in results for the simple fact that they had the keyword that they were ranking for in the website address. You see, back then, keyword optimization and back-link creation were the most popular SEO practices. Ironically enough, they were the most spammed ones. Many black-hat specialists would create low quality links, on obscure websites, spam comments and create irrelevant content simply to insert one or two suspicious links. As far as keywords are concerned, KWD stuffing was already a daily basis activity. Back then Google was definitely not the best source for your answers. You probably remember the times when you would click on a -doorway- site, and be sent to a totally different place. Obviously, this no longer happens in 2013 (with a few exceptions), and this is because Google has taken steps to optimize their filters and algorithms. One of the most important changes that they implemented was the EMD Update which turned the free lunches for those in-the-know, into a dead end. You can imagine how dissapointed and frustrated online business people were, but the truth is that they should have seen this coming from miles away. Matt Cutts actually warned people that this problem will soon be solved, and it seems that Slawski, Shigal and the team were working on this problem for quite some time now. You see, Google has no problem with EMD sites, as long as they provide value to the visitor, but as long as it is a thin site, filled with gibberish, it definitely does not want to rank it. The main purpose of Google is to rank websites that were build for people, and not for crawlers. As a result, not all EMDs were targeted by this update, but rather the ones that were violating Google’s rules: they were stuffing keywords, or giving false information. Just so you understand the force that EMDs had in the past, let’s take an example. Let’s say you are trying to rank for the keyword Caribbean luxury cruise. The first thing you do, is create your website: www.caribbeanluxurycruise.com. This will already ensure that you advance a few positions through SERPs. The next thing you must do is to stuff it with keywords like: Caribbean luxury cruise, Caribbean cruise, luxury cruise etc.. In the past, this would ensure that you gained enormous amounts of traffic from Google, and a decent position. But don’t think for one second that you somehow tricked the search engine by doing this. Google was aware of this problem since 2003. As a matter of fact, the patent for the EMD algorithm, systems and methods for detecting commercial queries was ready in September 2003. It was finally approved in October 2012. Matt Cutts also stated that the EMD game would soon change. But before you start cursing again, keep in mind that Google was quite transparent about their decision. They gave you a heads-up in March 2011, and it’s not like they punished every EMD site. The only ones that suffered were the ones which proliferated with the help of black hat SEO techniques. Was the EMD Update Really a Shock? After having analyzed a few sites in the past, we came to the conclusion that Google has indeed made the right decision. We actually came across a site that had face testimonials, accompanied by stock photography! Seriously? As a matter of fact, they even had a few keywords stuffed in the testimonials. Can you imagine how many innocent victims they made? People who really needed a certain service, and would fall pray to such lame practices? Even if EMD sites aren’t as effective as before, they still have a small advantage, as long as they are correctly optimized. The past few months were extremely difficult for SEO specialists because they were marked by several major algorithm updates. Let’s take a quick look back. On 8 May 2013, a mysterious update caused sites to plummets. It was dubbed the Phantom update, and according to different studies, it was content focused. A couple of weeks later, the Penguin 2.0 followed, and soon after the Penguin 2.1 (fifth update) also rolled out. They have had negative impact on the organic traffic of several sites. Unlike the Panda and Phantom updates, the Penguin is focused on combating web-spam (unnatural links, suspicious pages etc.). All in all, the SEO landscape is changing right before our eyes. If it was possible to pull things like keyword stuffing a few years ago, you can rest assured that this is no longer the case. Google is trying to rank sites that will actually help people, and can you blame them? Even if it is the online medium, trust is still important, and pages that can’t help anyone have nothing to do in the top results. Its mission is to organize the world’s information and make it universally accessible and useful, and if you think about it for a second, all you really have to do is to not violate quality guidelines, and build higher-quality websites. If you wish to stand a fighting chance, you should definitely review Google’s quality guidelines. In other words, you must make sure that you are not violating any of the rules. It’s not like you should be surprised by all the algorithmic changes. They are not a surprise at all. Google has already stated that it wants high-quality websites, so instead of worrying about then next catastrophic update, why not build brick by brick before? When the EMD Update initially rolled up, it didn’t smite all the exact match domains. As a matter of fact, the ones that were ethically build, and contained useful information, were rewarded. The only ones that got slapped were those which were built with the help of questionable methods (the most commonly perpetuated one being keyword stuffing). Domain age and overall domain strength are important parameters, and together with the other 200 parameters they will determine your position in SERPs. If you have an EMD website you can still promote it with anchors that reflect your website’s name. There is actually no problem with this practice, as long as keywords vary (meaning you don’t just spam the same anchor all over the world). Furthermore, instead of posting articles on article directories, or slapping them on obscure websites that have nothing to do with your niche, why not concentrate on creating amazingly awesome guest-posts for incredibly-awesome websites? A good backlink is ten times more valuable than 30 back-links on suspicious websites. According to several SEO Specialists it is still possible to put EMDs to good use, as long as you play by Google’s rules. 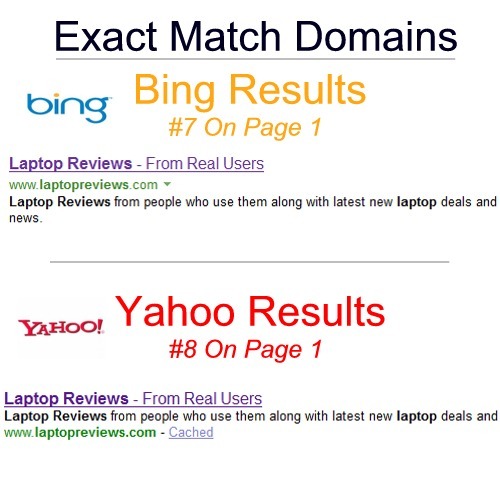 But before we get into any more details, it would be good to identify the types of exact match domains available. They can be sorted according to TLD extension (.com, .net, .org etc), dashed or non-dashed, number of keywords and “stop words”. Whatever you do, don’t choose double-dashed EMDs (I am also against single-dashed ones but if you really want one, you can go ahead). It has been proven that most double-dashed domains are spam, so stay away from them. The same rule applies to hyphens. The next thing you have to worry about is keywords. How many of them would you want in your site name? You should firstly consider the effectiveness of long-tail keywords for business, and also think about the possibility that a shorter name is already taken. Three keywords in a website name may sound like a lot, but it can work. However, don’t go for more than three words, and definitely don’t insert words like “in”, “for” etc. A good domain name can be www.seobeginnerguide.com, as opposed to www.theseoforbeginnersguide.com. The first address is easier to remember and type in. Last but not least, what extension would you like to have? You can chose from .com, .org, .net etc. You probably already know that .com is the best idea, but you can also go for something like .net/org. Don’t be a cheep skate! Invest in the best domain name for your site. Consider the possibility that you will actually grow your site in the future, wouldn’t you want it to have the best name ever? You can check the online market for domain names that are already old and reliable. Avoid dashes in the domain name, and stay away from second level TLDs that nobody has heard about. Can be an effective strategy with a well built microsite to target a single niche. Some businesses have very limited keyword sets – this is a decent approach in these areas. You don’t get the same “credit” for brand mentions. It has also already been proven that sites rank better when they have positive engagement metrics, and EMDs can help you with this. Statistics show that the length of time spent on a site, multiple page views, repeated visits and low bounce rates are beneficial, and with a little effort you can create exact match domains that meet engagement requirements. As we already mentioned, the EMD Update wasn’t as catastrophic as one might think. The loophole hasn’t been completely closed. As a matter of fact, it has only ensured that speculators were finally put in their rightful place. After changing its filters, Google actually turned the SEO war into a correct fight. In a world were search engines look for evidence that a site’s content is actually in demand and useful, social media plays a vital part. Mentions on each of the huge platforms will translate into interest from real humans. If you want to put this to good use, find an EMD that shows the intent of your business, and this way you will be giving yourself the best chance to land on the top of SERPs. 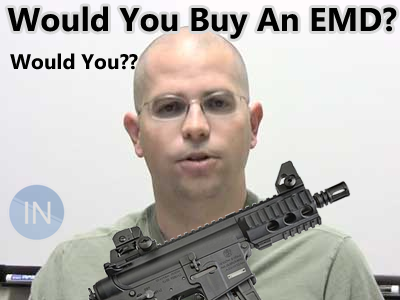 EMDs can cost a few thousand dollars, or a few billion dollars. It depends on how much the buyer is willing to pay for it. Most exact-match domain names can value even 99.999 dollars. And if you think about the type-in-traffic, limited supply and brand recognition and authority of EMDs its quite obvious to understand why certain business owners are willing to pay so much money for them. 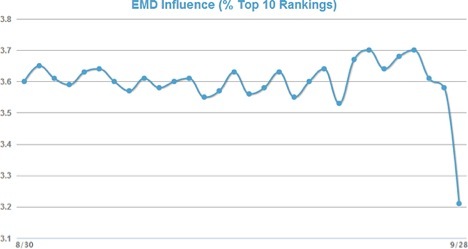 Even if Google released its update for EMDs, this doesn’t mean that you can’t find value in exact match domains. At the moment they are very trusted because they are easy to find, and they give a sense of trust and powerful brand. The more websites pop up the harder it will be for business owners to find a decent name for their website, so EMDs will sale for more and more money. Having a brandable name like Amazon.com can help you tremendously in the future!